In the ten years between 1940 and 1950, the population of Selden doubled from 847 to 1743. By 1960, it would more than double again. The growth of neighboring Centereach was even more dramatic; from 628 in 1940 to 3100 in 1960 and 6,676 in 1970. For many civic-minded citizens, it was time for a community library. In March of 1957, The Mid Island News announced the forthcoming opening of the “long-awaited library serving the Centereach and Selden communities.” A library Board of Trustees was formed and Board President, Lucille Hough, began a door-to-door canvas to solicit books for the new facility. The former Nature’s Gardens clubhouse on Middle Country Road in Selden was acquired from area developer, O.L. Schwenke. A local carpenter began renovations and volunteers were requested to help catalog the books. The library was to be open 15 hours per week and managed by part-time librarian, Sadie Hallock, assisted by volunteers. By 1961, the topic of the need for a new branch library appeared in the Board Minutes. Suggested sites were Jericho School or the former Centereach school. Neither proved possible. 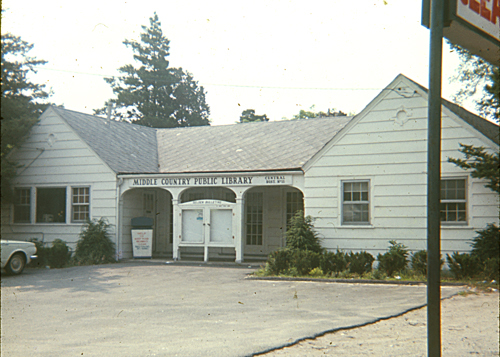 In 1963, when a new Centereach Post Office was built, the site of the former post office became available for rent. In June of 1963, a lease was signed for 8 Dawn Drive which would be available by year’s end. A “Stack the Shelves” drive suggested by Mr. Jones of Tinker National Bank announced that the bank would contribute $500 plus $2.00 for every new depositor over a stated period. In addition, Bernard Kaplan, Eastwood Village developer, pledged $500 to start the campaign. Circulation figures for the library increased every year. 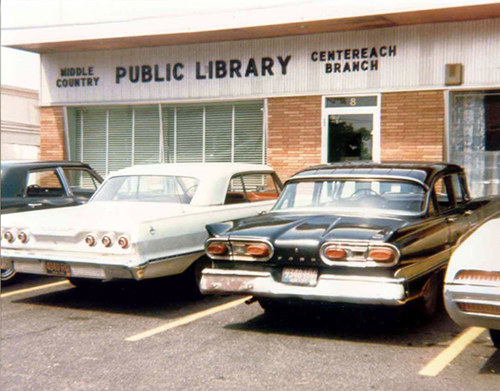 In 1964, the first year both libraries were in operation, the circulation was 54,570. By 1967, it has risen to 176,145. 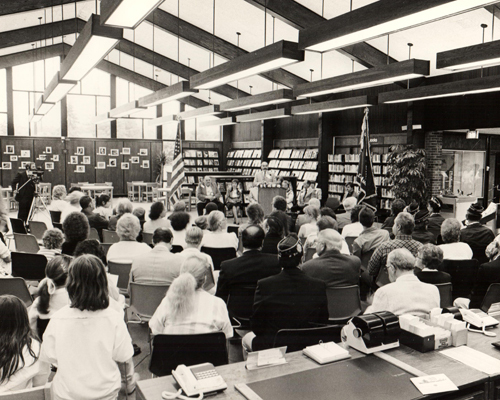 In 1968, the name change to Middle Country Public Library reflected the consolidation of the school district. That same year, the Board hired Paul John Cirino as the Library Director. As the number of school age children surged and the school district became the fastest growing in the nation, the library kept pace to meet the needs of the increasing population. A search was begun for a suitable site of approximately 3 acres with a minimum frontage of 150 feet and close to the center of population and not more than ¼ mile from Middle Country Road. 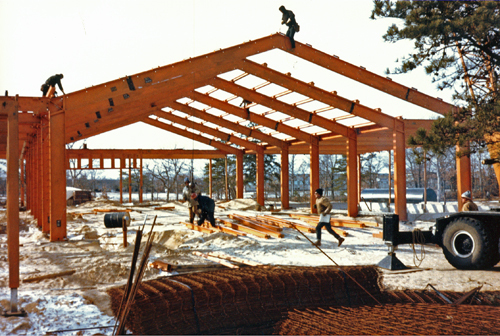 In 1971, ground was broken for a new building on the corner of Eastwood Blvd and School Street. The new 19,000 sq. ft. building, which was dedicated on January 30, 1972. It would seat 180 readers, have sufficient shelf space for over 100,000 books as well as a community room for local organizations that could remain open after library hours. To serve the family as a unit, and to assist parents in their role as primary educators for their young children, in the fall of 1979 the Children’s Services Department organized and conducted an experimental program for parents and babies, aptly titled the Parent/Child (P/C) Workshop. Unlike traditional programs for preschool children that were commonplace in public libraries at the time, the P/C Workshop focused on infants, toddlers, and their caregivers. It emphasized play as a precursor to literacy, the need for parental involvement in the child’s earliest learning experiences, parents’ use of library resources in their parenting role, and the children’s librarians’ role as an early literacy, information, and referral specialist. The most interesting and unique aspect of the program was the integration of professional expertise from social service and health agencies into library services. The P/C Workshop and the resulting evolution of library-based early childhood and family-centered services eventually formed the cornerstones of the Family Place Libraries™ national initiative, which today continues to support the P/C Workshop with parents and their children. 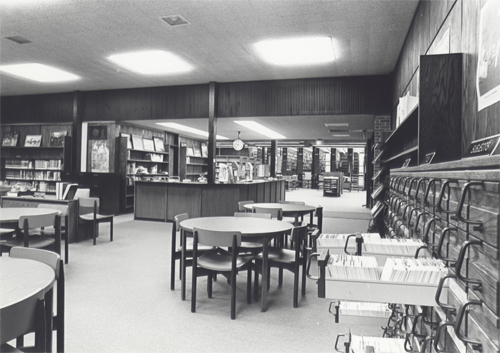 By 1981, the number of library cardholders had exceeded 51,000 and the annual circulation topped 500,000. Program attendance continued to rise and space for additional programming was at a premium. When the lease on the Selden Branch expired, the School District offered the unused Selden Elementary School to the library. 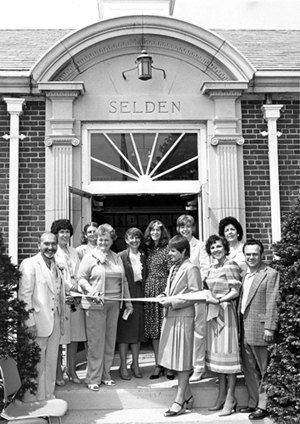 In 1983, after remodeling the school to provide handicapped access and library furniture and shelving, the Middle Country Cultural Center at Selden was opened to the public. An auditorium, complete with a stage and seating for almost 200, afforded a venue for community dramatic and musical productions. A former classroom became “The Computer Place,” hosting over two dozen PC Junior computers with appropriate software for recreational and personal use. A variety of workshops, taught by skilled teachers, provided new computer technology instruction to library patrons of all ages. 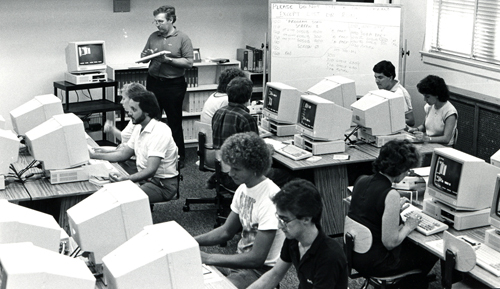 Computerization had also come to another library mainstay in 1984. The Gaylord Circulation System was installed, replacing the old card catalog with a computerized public access catalog. 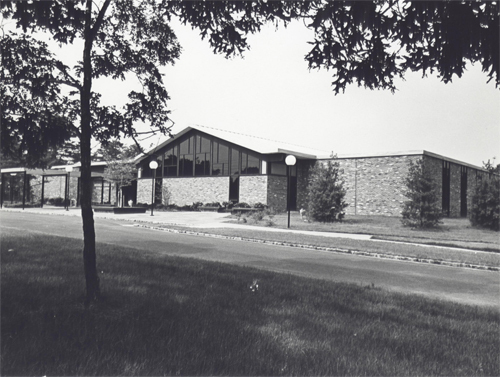 To accommodate the growth in services and the need for additional facility and Parking space for library users, a bond was submitted to the voters and approved in 1985 for an expansion to the Centereach building. A second floor was added to house the library’s processing functions and administrative offices leaving the entire ground floor for public space. 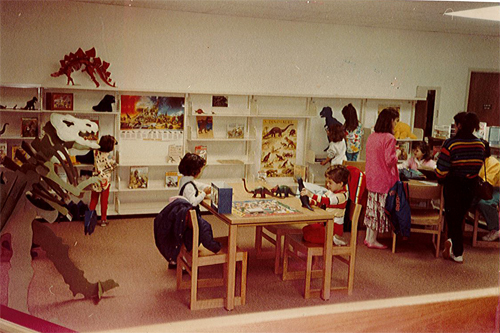 The renovated 53,000 square foot building, with greatly expanded space for children’s services, officially opened on December 15, 1986. New innovative concepts and programs were introduced over the next decade. A section of the Children’s Room became The Museum Corner, an interactive exhibit space featuring hands-on exhibits and programs for children and their families. The Career Information Center made its debut offering college and career materials, programming and counseling for MCPL patrons. The Suffolk Family Education Clearinghouse received recognition and funding from state and local governments. MCPL was awarded the American Library Association’s prestigious John Cotton Dana Award. A library newsletter, MCPL News, was introduced in 1989. Cognizant of the changing demographics of the MCPL constituency, a new section entitled WISE (The World of Information for Seniors and the Elderly) was developed. Programs specifically designed to meet the needs of seniors in the community were offered including Senior Connections, a library based information and referral service. Upon the retirement of John Paul Cirino in 1991, Sandra Feinberg was named Library Director. 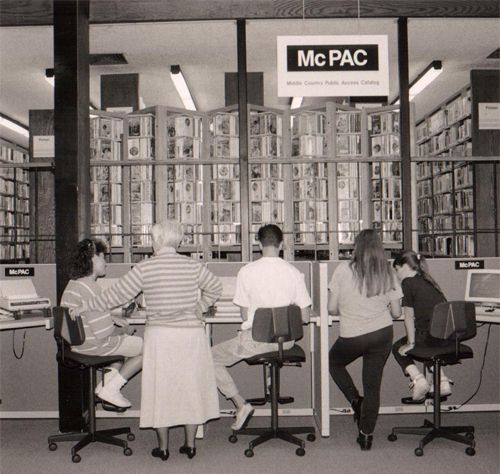 The Library implemented the Middle Country Public Access Catalog (McPac), an integrated library system, in 1991, and the Community Resource Database (CRD) was added to McPac. The Friends of the Library was established in 1994 to foster closer relations between the library and the community and to support the library’s functions, resources, services and needs. In 1996, MCPL was approached by Libraries for the Future (LFF), a national library advocacy organization whose mission was to promote innovative programs and services. Together they trademarked “Family Place Libraries” and began to raise money for national replication of the P/C Workshop program model, the creation of an early childhood and parent space on the public floor, and the development of collaborative services with local family serving agencies. Some of the initial major funders included the Hasbro Foundation and the states of Arizona and Pennsylvania. A group of Long Island Funders including the Rauch Foundation, Horace and Amy Hagedorn Foundation, the Sandy River Foundation, the Pritchard Charitable Trust, and the Long Island Community Foundation were instrumental in the development of Family Place in Suffolk and Nassau Counties (NY). Known as Family Place Long Island, these libraries serve as an incubator for a number of collaborative services that are vetted on Long Island and promoted nationally. MCPL continues to manage the national initiative including onsite and online training, site visits, conferences, and publications. The County of Los Angeles Public Library (COLAPL) has been a major partner, raising funds to implement Family Place in over 40 libraries in their system. In 2009, the state of California and COLAPL partnered with MCPL to develop a West Coast training center and implement Family Place in 35 libraries in the state. In 2013, MCPL was awarded an IMLS grant to replicate Family Place in 27 libraries in 8 mid-western states focusing on the integration of Family Place within the early childhood and family support communities. To date, over 500 libraries are considered part of the Family Place network. 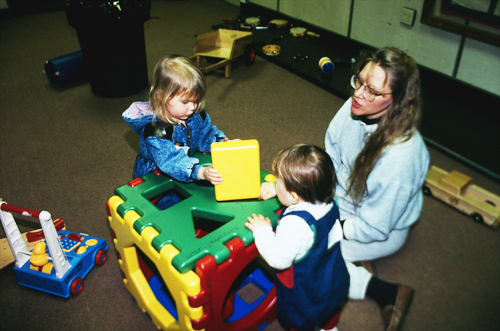 Judging from the many evaluations of program impacts, Family Place has affected the development of MCPL as a Long Island institution, the libraries that have adopted the program and the roles they play within their local communities, and the many families throughout the United States who have experienced the family-centered and early childhood environments and services that have been replicated. Public libraries are undergoing major transformations in who they serve, what they offer, and why they exist. Family Place has been recognized as a viable way to serve the public, particularly focusing on the potential role that libraries can play in the development of very young children and their caregivers. The need for a foundation to manage the library’s increased grants and growing regional and national projects led to the formation of the MCL Foundation in 1997. The foundation is a 501 (c)(3) corporation whose purpose is to raise funds and provide the governance structure for the Library’s initiatives that extend beyond the local community. The Foundation assists the Library in managing its growing number of regional and national initiatives and maintaining its leadership role in the broader community. As the new millennium approached, plans were underway for two new building projects to create the library of the future. On October 28, 1999, voters approved a bond issue for the expansion of both MCPL buildings. 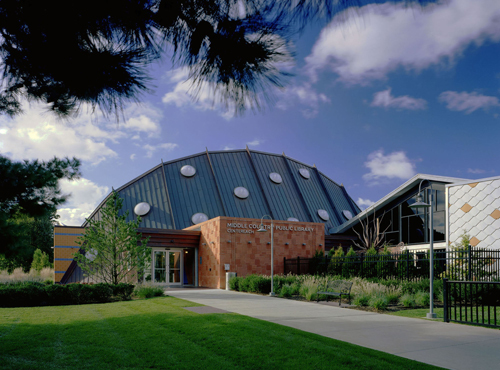 With strong business, government and philanthropic partnerships, the foundation launched an Enhancement Campaign in June 2000 to support the building project and make a “dream library” a reality, with lead gifts from Horace and Amy Hagedorn, John D. Miller and the Rauch Foundation. A year later, a groundbreaking ceremony was held. 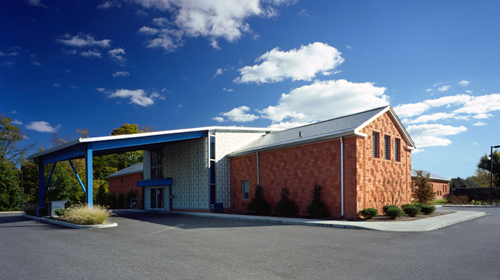 The Selden building was officially opened December 4, 2002; the Centereach building on November 15, 2003. 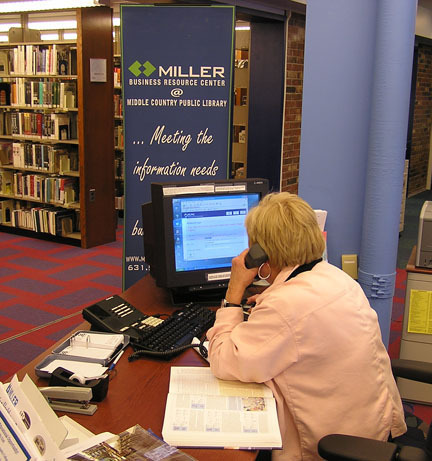 Aware of the need to support the local business community, in 2003 the library created the Miller Business Resource Center, a regional resource for businesses, independent entrepreneurs, not-for-profit organizations, and individuals, offering access to extensive and specialized business resources as well as personalized business research and reference assistance. The center’s programming includes the annual Strictly Business Tradeshow and the Women’s EXPO. 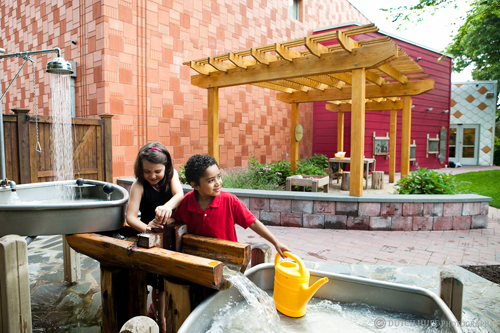 In 2010, Middle Country Public Library proudly became the first library in the nation to offer a nature explore classroom when it opened the Nature Explorium, an outdoor learning space for children and families. 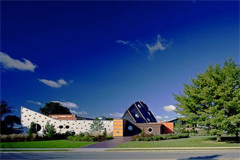 Developed in collaboration with the Dimensions Educational Research Foundation and Long Island Nature Collaborative for Kids (LINCK), the Nature Explorium, opened in July 2010, contains a variety of areas, all geared toward connecting children to a different aspect of nature. Whether they’re reflecting on a poem under a willow tree, climbing on a tree stump, or expressing artistic talent through song and dance on the Play It stage, children will discover the gift of nature. Upon the retirement of Sandra Feinberg in 2013, Sophia Serlis-McPhillips was named the new Library Director. The library updated its circulation system in 2012 to incorporate RFID rechnology, and implemented a completely self-service system for checking in and out library materials, making the process much more efficient and reducing lines and wait times for library patrons. The new system included a drive-up return unity that is available to patrons 24 hours a day. With an annual circulation of 1.5 million, 2,400+ programs each year, and 12 meeting rooms in constant use, MCPL’s 107,000 square foot, two building expansion made it the largest and busiest library on Long Island. Dynamic architectural spaces reflect the ever-changing innovative and creative activities taking place within the library, which is always looking forward to draw in new audiences and find ways to make the library an even more responsive heart of the community.